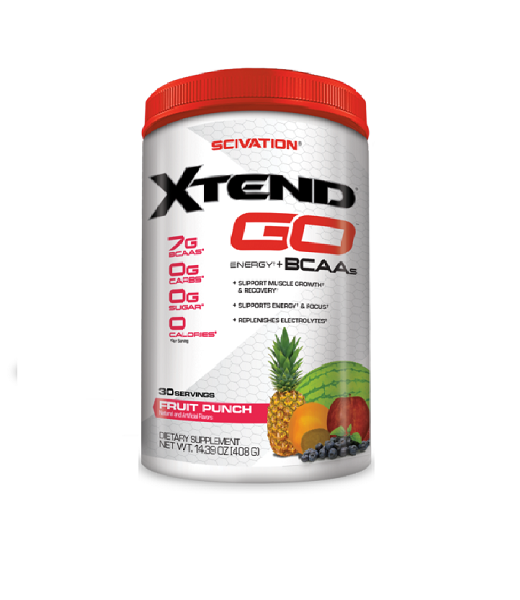 Scivation Xtend contain a blend of hydration-inducing electrolytes and 7g of BCAAs at a 2:1:1 ratio. Why? Because it's been scientifically documented. So that's 3.5g of L-Leucine. 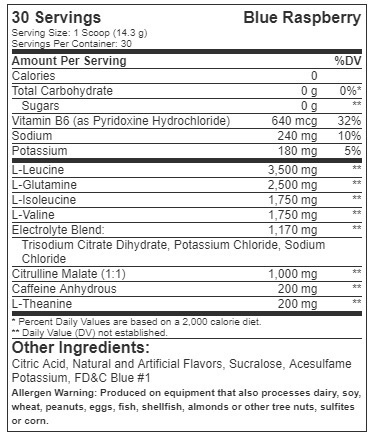 1.75g of L-Isoleucine and 1.75g of L-Valine in every scoop. Plus, we've added Caffeine and L-Theanine for energy and focus. WHICH MEANS WE CAN GIVE YOUR MORE FOR LESS. This product is only intended for healthy adults, 18 years of age or older. DO NOT USE IF PREGNANT OR NURSING. Consult a licensed, qualified healthcare professional before using this product, including but not limited to, if you have been treated for, diagnosed with, or have a family history of, any medical condition, including but not limited to: high or low blood pressure, diabetes, prostate enlargement, cardiac arrhythmia, stroke, heart, liver, kidney or thyroid disease, depression, anxiety, psychiatric, or seizure disorder; or, if you are using a MAOI (Monoamine Oxidase Inhibitor), SSRI, blood thinner (anticoagulant), CNS depressant or sleep medication, or you are taking any other dietary supplement, prescription drug or over-the-counter medication. This product contains caffeine and should not be used by individuals wishing to eliminate caffeine from their diet or in combination with caffeine or stimulants from other sources, including but not limited to, coffee, tea, soda, other dietary supplements and medications. Do not use this product if you have any serious medical conditions. Discontinue use 2 weeks prior to surgery. Immediately discontinue use and consult a licensed, qualified healthcare professional if you experience any adverse reaction to this product. Do not exceed recommendations for use. Use only as directed. Do not use if safety seal is broken or missing. Store in a cool, dry place. KEEP OUT OF REACH OF CHILDREN.